Many people have walked through the woods of Nova Scotia and been serenaded by the chatter of a red squirrel ( Tamiasciurus hudsonicus ). This bold, agile rodent is easily identified by its brownish-red coat, cream-or-gray-colored underparts, and bushy tail. Red squirrels frequent softwood or mixed forests that contain mature trees. They primarily live in trees, but also dig burrows in the ground. They are active during the day year round, except in winter storms or cold spells. Red squirrels eat a variety of foods, including softwood cone seeds, hardwood nuts, buds, flowers, fruits, mushrooms, insects, birds' eggs, and mice. They raid bird feeders and sometimes take up residence in attics, garages, camps, or bird houses, where they may build nests to deliver their young. Another squirrel that occasionally feeds at bird feeders is the northern flying squirrel ( Glaucomys sabrinus ). This animal is not often seen because it is active at night. Flying squirrels are smaller than red squirrels and have large, dark eyes, a buff-grey upper coat, and a white and grey underbelly. They are unique because they have a loose fold of fur-covered skin that stretches from the front feet to the back feet along their sides. When airborne, this skin fold enables a squirrel to glide for long distances because the flattened, furry tail acts as a rudder. Flying squirrels prefer to live in a mix of mature softwood and hardwood trees, building their nests inside hollow trees. Many flying squirrels may inhabit the same den site in winter for warmth. Red squirrels have two distinct breeding seasons, March and July, with young born in April and August. Flying squirrels breed in March or April, giving birth to their young between April and May. Both species give birth to three to seven young. The provincial Wildlife Act lists red squirrels under furbearers and other harvestable wildlife. They can be hunted or trapped from November 1 to February 28. If they are causing damage to a person's property, these squirrels may be taken at any time of year. This should only be a last resort once all attempts have been made to discourage them. Flying squirrels are protected under the Act and cannot be trapped or killed without a permit from a Department of Lands and Forestry office. Red Squirrels and, to a lesser extent, flying squirrels, collect conifer cones for their winter food supply. However, for every seed they remove from a forested area, others remain from cones they have hidden and left in the ground. Evidence of squirrel activity is identified by squirrel middens (large piles of conifer cone scales) where the squirrels have sat and eaten the cones. Red squirrels also chew growing buds on leaders of young trees. Both squirrel species take food from bird feeders. Homeowners often see animals stealing food. However, flying squirrels are active only at night and may not be seen. Telltale signs include tracks and droppings. Squirrels may enter a building to find protection, to store food or to build nests. These intruders are often seen entering and exiting a building or are heard running around inside the walls. To gain entry into a building, squirrels use existing openings and enlarge small openings by gnawing. Once inside, they can cause serious damage by chewing electrical wires, ripping insulation, and tearing other material. To deter squirrels from raiding bird feeders, remove all food for a period of time. This is usually only a temporary solution, especially if the squirrels are neighbourhood residents. Some homeowners solve the problem by providing the unwelcome guest with its own platform feeder, in addition to bird feeders that have small, squirrel-resistant openings. If a homeowner wants to protect individual trees or bird feeders in trees from damage, a metal collar (60 cm wide) can be placed around each tree trunk about 1.5 m off the ground. The metal should be installed to allow for tree growth. Trim tree branches to discourage squirrels from traveling between trees or from tree to building. 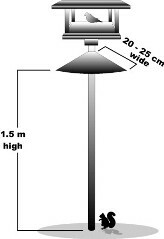 Feeders erected on poles can be protected by attracting inverted metal cones below the feeder. When a squirrel travels up the pole, it is prevented from reaching the food source. If prevention techniques fail, removal may be necessary. Chemical deterrents, such as mothballs (naphthalene), may temporarily deter squirrels from entering buildings. A cat may also discourage the unwelcome visitors. However, fixing entry holes in buildings and removing squirrels are the two best methods for dealing with the problem. Squirrels are easily live-trapped in small box traps that can be bought at hardware stores or farm co-op's. To prevent damage to property, homeowners are permitted to kill red squirrels. This can be done using rat-size snap traps. Effective baits for both traps include peanut butter, peanuts, or other nuts. Shooting red squirrels is permitted when other methods don't work, provided homeowners comply with firearm regulation. The most effective way to prevent squirrels from entering a building is to keep the structure in good repair. Any openings should be fixed or closed off with heavy wire mesh. Squirrels may host parasites, including ticks, fleas, mange mites, bot fly larvae, and internal parasites. They carry some diseases, although these rarely affect humans or pets. Handle dead animals with gloves. Squirrels are important to Nova Scotia's forest ecosystem as seed dispersers, and also as a food source for many mammals and birds, particularly birds of prey. Visiting feeders is normal behavior for squirrels, as they have found an attractive food source. Many people enjoy watching squirrels. Sharing your backyard environment with this attractive wild animal can be a rewarding experience.